I’ve been thinking quite a bit about my running pace recently. After deciding to forego my longer runs to focus on my form, I have seen a dramatic increase in my pace (specifically on my Saturday 5k runs + 5k walk back). The first weekend doing this workout I finished in 30:00 – over a minute and a half faster than my previous pr on my Nike+, and a whopping 4:30+ minutes less than my 5k pace at my one and only 5k race this past fall. I was shocked at my ability – and this past weekend? I blew 30:00 out of the water with under 28:30!. Granted, this is not a speedy speed for a lot of runners, but it is for me. I can tell that I am working harder running the faster speeds, but it helps knowing I only have a little over 3 miles to keep it up. I remember I used to wish I could run 3 miles even just last summer – and I was unable to. And now I am running the entire thing and running it fast! It still shocks and amazes me of what our bodies are capable of. Now, speaking of capabilities, I am not currently capable of running a 1/2 marathon. Well, I might be, but it wouldn’t be pretty. Good thing I have until January for my first at Walt Disney World! (By the way, check out my guest post on Healthy Disney today!). Since this is my first 1/2 marathon, I know I should not have a set goal time in mind, but that’s not always how I work. I am usually competitive and it frustrates me that even though I want to be competitive at running – I will never be a great runner. I’ll get over it… maybe. Kinley decided to sign up for the Clif Bar Pace Team for the Disney race – to see what it would be like with someone else pacing you rather than having to think about it yourself. Well, even though I signed up for a slower pace time, I decided I would contemplate running with a pace team as well. What’s really nice about the Clif Bar Pace Team is that it is FREE, and it has absolutely no obligation – meaning if I didn’t want to run with them come race day, I wouldn’t have to. I could also switch my pace group I was running with the day of the expo in case I find my speedy marathon legs within the next few months. Something else that’s awesome about the Clif Bar Pace Team?? They send you FREE products to try and I just to happened to get my first on Monday! 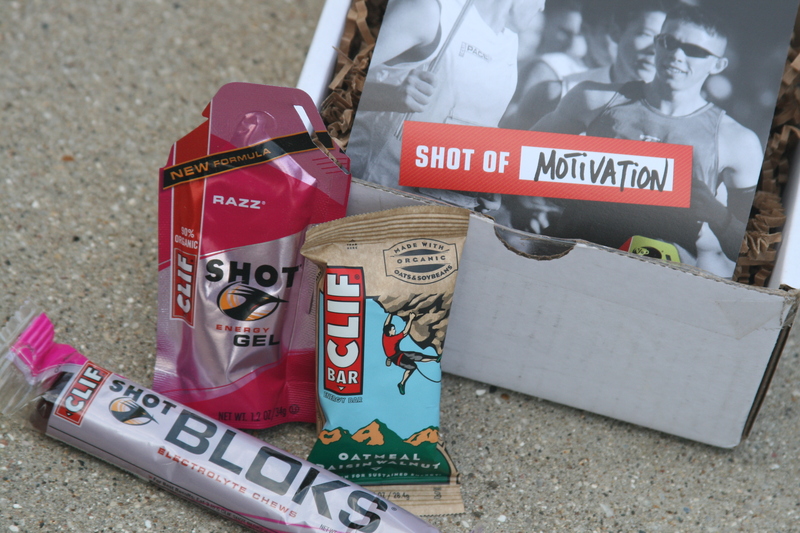 It included a Oatmeal Chocolate Chip Clif Bar, a Raspberry Clif Shot, and a Cran-Razz Clif Block. Can’t wait to start my training and increase my distance so I need these! Speaking of training – I should probably think of what training plan I’m going to do and see when I’ll need to start!